So you managed to make it through Monday (YAY!!!!) so we think you deserve a treat. So what better way to treat yourself than to look after your skin. I swear by REN Skincare as it is one of very few brands that use 100% plant and mineral derived ingredients making it perfect for even the delicates of skin. 1- Rosa Centifolia 3-in-1 Cleansing Water (£13 renskincare.com). This is my number 1 product as it is a detergent free ‘beauty water’ that is great for a make up remover for even the most sensitive skin and its even great for removing difficult eye make up. Your skin always feels fresh once you use it. 2- Vita Mineral Omega 3 Optimum Skin Oil (£25 renskincare.com). A must in cold weather. The oil re-energizes skin cell activity giving your skin a plumper and fuller look (which is great for those wrinkles too). All you need to do it apply 2 to 3 drops under your moisturiser in the morning and your good to go. 3- Evercalm Global Protection Day Cream (£28 renskincare.com). Again this is a must as it contains Omega 3 and 7 oils which help restore moisture in skin and aid cell renewal along with providing a natural barrier against the daily elements. 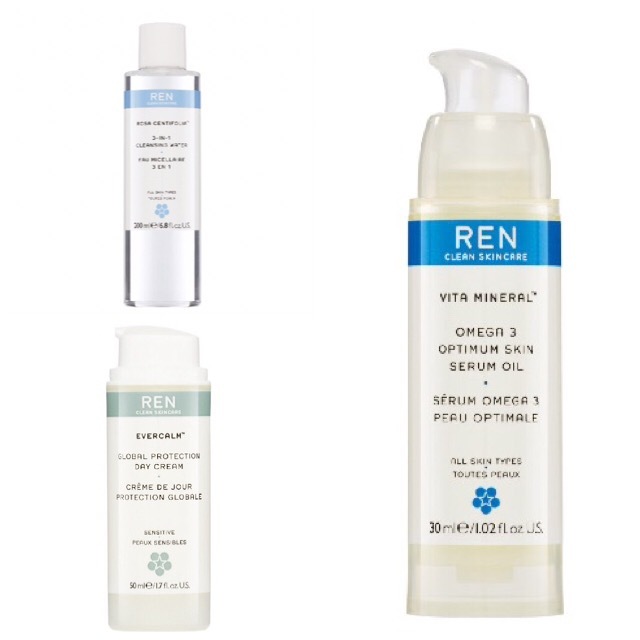 The best thing about REN skincare is that they really do offer something for everyone with there products broken down into categories depending on your skin type (Sensitive, Combination, Dry, Blemish prone and Anti-Ageing). So you can really target in on what you want to focus.